CLIENT: Prince Alumer Development Corp.
Fittingly described as Scape, after its inception from the landscape and seascape ripple forms – an ode to the natural setting before the project was realized, Scape is an 11-storey mixed-use building in MOA Complex, a reclaimed developing town located south of Manila. Built on a reclaimed area, the inspiration for the building’s façade was drawn from the ripples of water entrenched on the sandy shores of Manila Bay. The undulating patterns found on the building’s skin mimic the shape of the sea as it slowly drifts off. 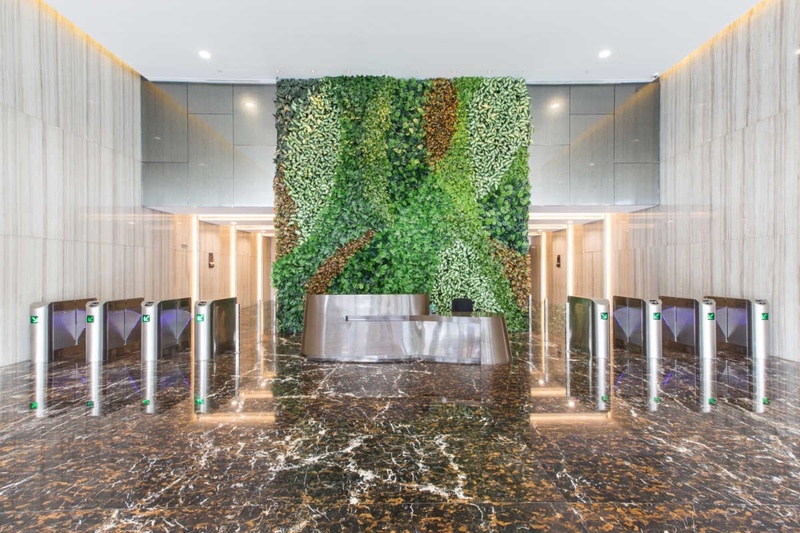 In a sense, Scape also aspires to produce a ripple effect on its neighboring structures as it sets the standard for building green BPO offices that are environmentally responsible and resource-efficient. 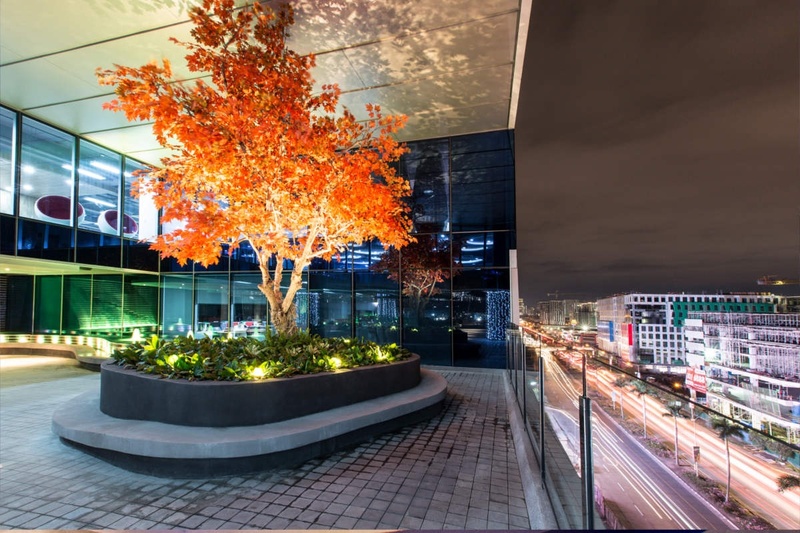 Built for a BPO or Business Process Outsourcing office, local firm ASYA Design programmed 33, 013.79 square meters of enclosed office space, and embraced an 800 square meter sky garden deck located at the eighth level featuring a garden space, smartly identified as Escape. The sky garden deck is a strikingly landscaped public realm open for socializing space, casual meetings, events, and intimate gatherings. The garden will have a meandering pond surrounded by sand-like structures to highlight the design concept of water and sand ripples. 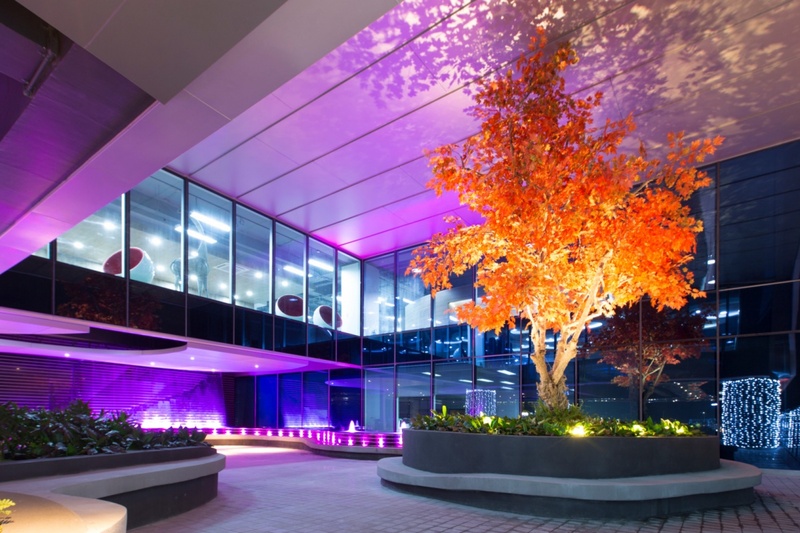 Escape’s most prominent feature is the 5 meter orange Tree that stands tall and cuts through the 9th and 8th floor offices. Its vibrant tangerine leaves glistens in the light and creates an enchanting glow that radiates not only on the deck itself, but also from the busy streets of Macapagal Ave. This gleaming icon is further emphasized against the white and blue rippled patterns of Scape’s façade. 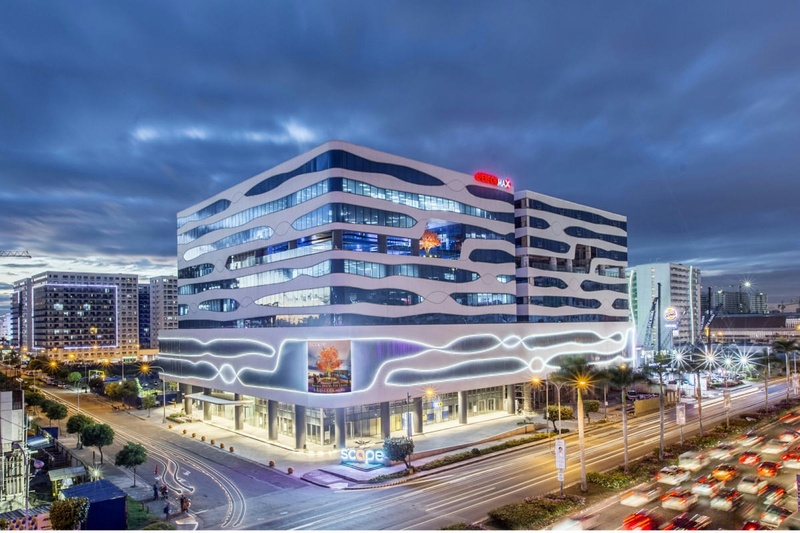 One of the first gems of its district, the building is the newest mixed-use development having both commercial and office programs in the thriving and expanding Mall of Asia Complex in the city of Pasay. 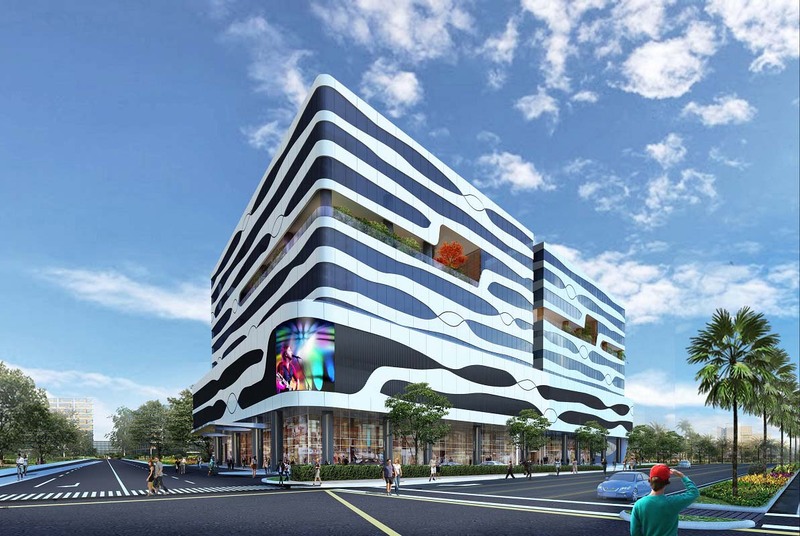 The development caters to the successful BPO industry in the area and the densely populated complex of Mall of Asia with countless residential buildings and lifestyle centers. Energy conservation is made possible with its high performance glazed windows featuring double-layered glass with IGU and low e-coating. 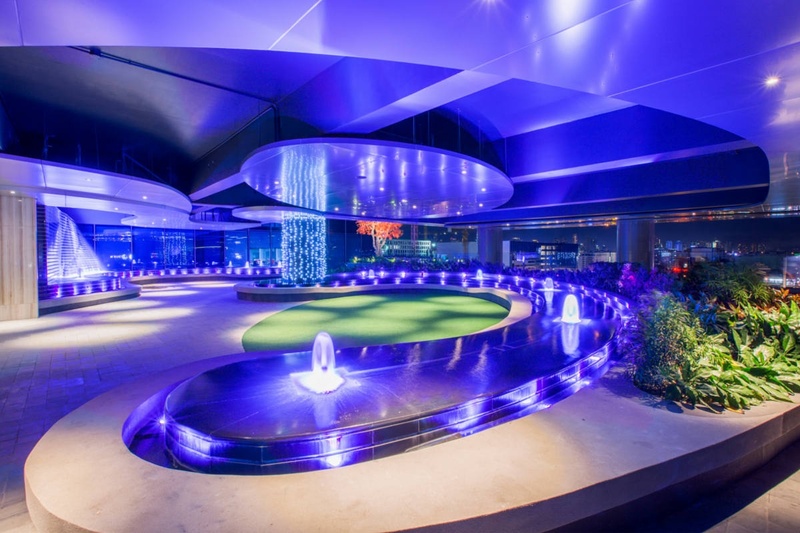 It boasts of its cutting edge green architecture merging modern technology and natural resources. Rainwater is harvested for different everyday uses such as watering plants, toilet flushing, and maintenance cleaning. Low flow plumbing fixtures are installed to maximize efficient water use. To complement the building’s green technology, a row of bicycle storage areas are provided to enhance the user’s green lifestyle. Offices largely occupy the upper levels, but a towering lobby welcomes guests to a 7-meter high ceiling. A mezzanine level fills the void catering to a bank, coffee shop, and other commercial shops. Open-planned office areas are designed to serve different functions to preserve flexibility and interaction between the different levels. With an average floor plate of 2,700 square meters per office, the building maximizes the space’s potential by housing more users per floor. The building also makes use of the development lot by creating car lifts in the podium parking to maximize space and accommodate required parking. The building has been recognized by the US Green Building Council as a LEED® Certified™ and LEED Silver® development. Scape has been awarded Best Mixed-Use Office Project at the Philippine Urban Land Institute Healthy Places last July 2016. ASYA Design has been awarded the 2016 Philippines’ Best Sustainable Architecture Firm by the Sustainable Building Awards presented by UK BUILD magazine.